Juicebox Recording Co. is offering up a free download of their latest compilation, called Free Health Care + MP3s II: Canadian Fest Comp, in honour of those brave Canadian souls venturing down to Florida to play the vaunted the Fest. The compilation includes previously unreleased material from Mockingbird Wish Me Luck (Dine Alone) and Saint Alvia (Union/Stomp). 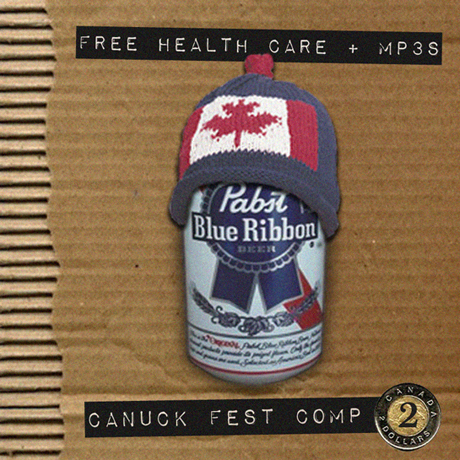 Download Free Health Care + MP3s II: Canadian Fest Comp here. 1. Shared Arms "Both Hands"
3. Junior Battles "Passing Out"
8. The Sainte Catherines "Theme Song For Another Brown Tuesday"
9. O Pioneers!!! "Hey, That's My Blood"
10. The Snips "Tired Tires"